A mallet is a versatile hand tool, often found in the hands of woodworkers. The five best mallets are compared and reviewed. A mallet is a type of hammer, and usually found in the hands of a woodworker - and they come in a variety of shapes and sizes. You can buy them made of wood, rubber, fiberglass, a combination of all three - there's even the odd plastic mallet available on the market. The size and type depends upon the task they're required for - some are specifically designed for wood carving, others for brute force - such as a dead blow mallet. There are other varieties that can be used in the shaping and refining of metals, or for the purpose of jewelry crafting and similar crafts. The five best mallets are featured below. They're all well designed, great all round quality and offer the best value for money, as well as being popular and highly rated. 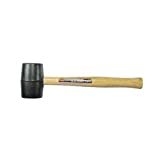 This is the best selling rubber mallet - 32 ounces of good solid rubber that's great for working with materials that need some brute strength but won't look good with a great dent in it or a damaged edge. The handle is solid wood and the connection to the mallet's head feels solid and stable. It did a great job of tapping down laminate and was none too bad when it came to stomping a few fence posts into the ground - none of which would have had quite the same finish if I'd used a ball peen hammer or a sledgehammer. A good quality hand tool, built to last and even better - it's under 10 bucks. This is the best selling wooden mallet - and it's a nice quality about it, which makes it good for woodworking. Used in conjunction with a chisel it does a nice job - whether you're tapping out detailed work or need to get on with driving wooden pegs in. The manufacture is top quality beechwood and the handle to head balance is nice enough. As crown mallets go, it's not a bad example. The head works extremely well with a variety of chisels - no slipping off the top or damage to the chisel head to report. It weighs 20 ounces, which is a good general weight for this type of hand tool. Nice build to it, solid construction - one to buy if you're wanting an inexpensive chisel mallet. As cheap mallets go . this is as good as it gets. It's amazingly good quality in relation to the price. For a little over 4 bucks you're getting a dual aspect mallet that will deliver both soft and hard blows - depending on which side of the head you use. It's more than adequate across a range of tasks and the quality of its manufacture is impressive. I've spent 5 times the price of this one to get around the same level of function and can't really fault it in any way. The handle is a cushioned tubular steel - vibrations aren't anything to write home about when you're making a few hefty strikes and you get a good grip with it. Balanced, versatile - and for the price it's possibly the best bargain I've found in a while. This is the best selling dead blow mallet and it's available in three weights - 32 ounce, 8 and and this one - 24 ounces. It's a durable plastic one piece mold, with a typical hollowed out head and sand half-fill. It's as bright an orange as it gets - the picture doesn't do the color justice - and you're not going to lose it in the crowd at the bottom of your tool bag. It delivers an awesome blow, time and again, and if you're in the mood for a softer touch it's just as happy to be reined in and tap away rhythmically. Great on construction sites, in a wood workshop or even just to stow away at home for round the house tasks. The quality and weight's right on the button, great price tag - one to smash things with. 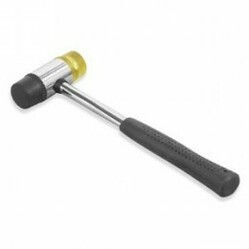 This one's another top selling chisel mallet - 12 ounces, solid wood handle, high on quality and manufacture. The heads made out of urethane, it's ability to absorb shock is second to none and the handle is fitted securely into the head. It won't mar the surface of pieces you're working on if you use it directly and it's superb for chisel work. It's a high end joiners mallet, up to a standard that's reliable, durable and comfortable to use for longer periods. If you enjoy wood carving, or your working day involves a fair amount of carving, this is the best mallet for the job - recommended.